Looking for a small press to submit your poetry collection or manuscript? 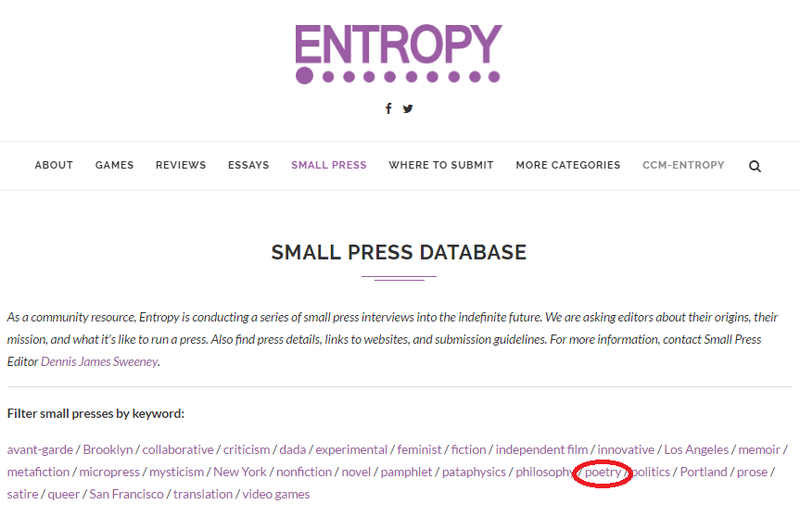 Our friends at Entropy have been interviewing small presses and adding them to their Small Press Database which now has over 115 listed! They ask the “editors about their origins, their mission, and what it’s like to run a press. Also find press details, links to websites, and submission guidelines.” Check out the listings of presses like Sundress Publications, BlazeVox, and so many more. And, if you are an editor at a small press, you can still contact them to be added to the database. Entropy is a “website featuring literary & non-literary content. A website that seeks to engage with the literary community, that becomes its own community, and creates a space for literary & non-literary ideas.” Make sure to check out all the resources they offer, including Where to Submit, Reviews, and more. Alliteration: Does it Articulate, Arouse or Just Aggravate Your Audience? Reblogged this on Echoes of a SalamanDer – Don Beukes.